My critical eye sees this completed storage piece as crooked, some of the slots are more narrow than others, and I see all the flaws. The next one I make for my home made spritzes will be made a little differently and I have found the math I used on the ink pad storage was a little bit off. 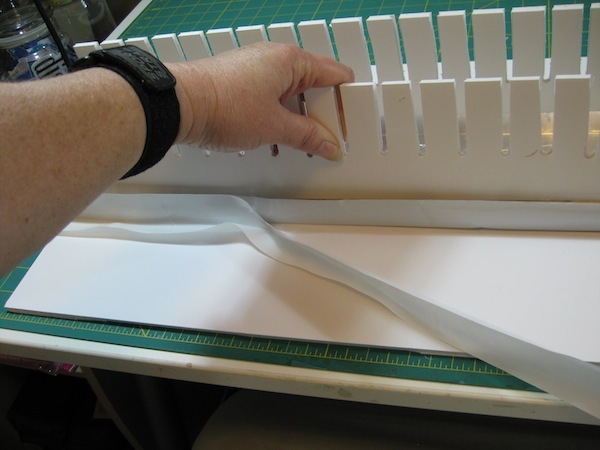 If you make one of these, add 3/16″ on both sides of the top and bottom widths of your pieces. 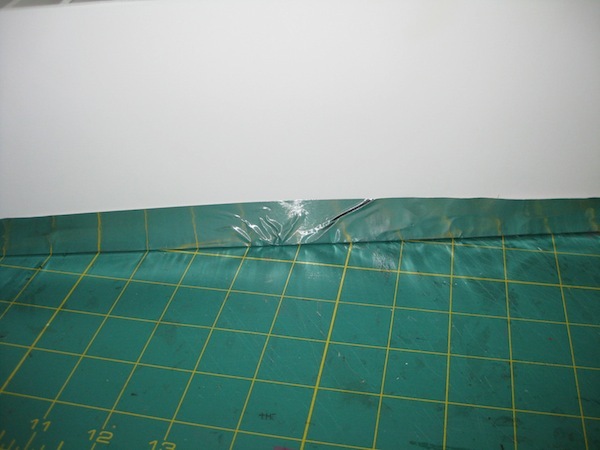 That will ensure your outer pieces match up for clean corners. As you see in the photo above the top piece doesn’t go all the way out to cover the side pieces. Also, when I finished this thing and slid it under the radio/cd thing – it didn’t fit. I had to take the bottom piece off in order to get it underneath. Am I ready to tear this thing apart and start over? No. It serves a function and it is just fine the way that it is. Okay. Now to finish where I started yesterday. 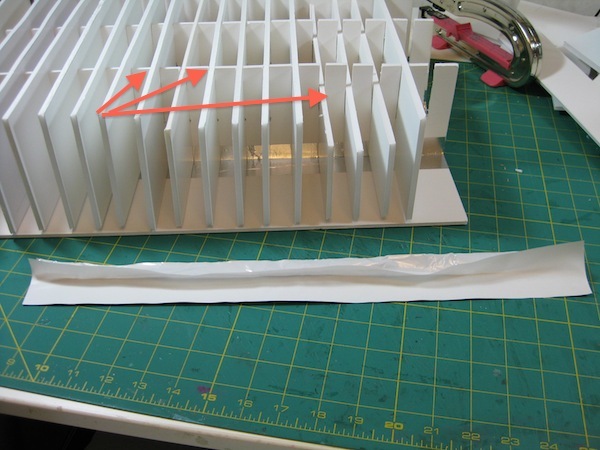 I measured for the divider supports at 4-1/4″ and 8-1/2″, drew lines from top to bottom along the 18″ length and used the metal duct tape to adhere the support. 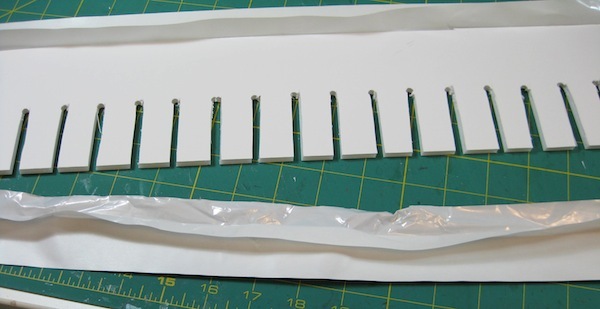 I peeled back only half of the adhesive cover on the metal tape and attached that to the back side of the support. 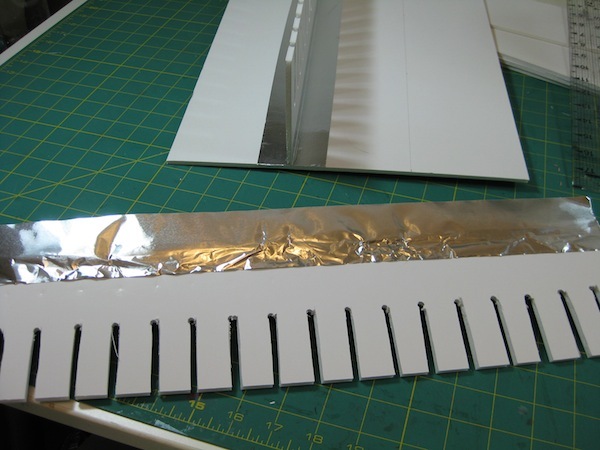 The second piece of metal tape will have only half of the adhesive cover peeled away. The adhesive on this metal tape is SUPER STICKY and the metal is SHARP. I cut one of my knuckles during this process. 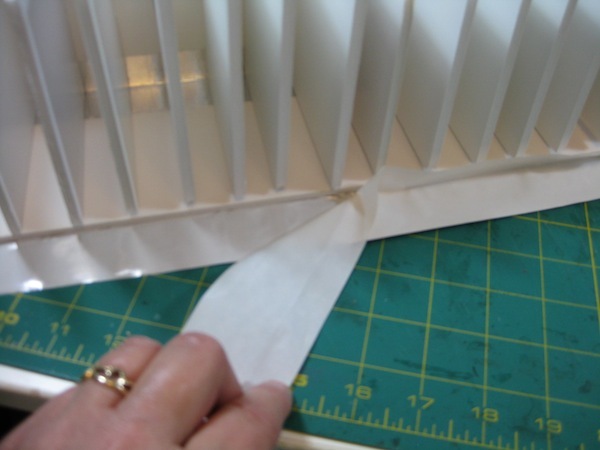 Attach the exposed half of the tape to the length of your support and press it down with your fingers. Use a bone folder to press out as many of the kinks as you can. 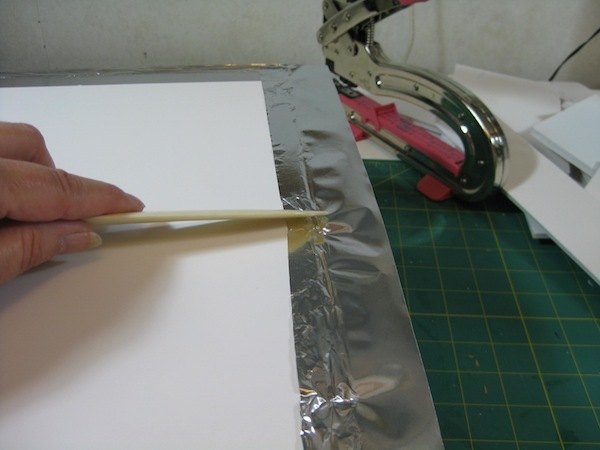 The bone folder will ensure the metal tape is fully adhered to the surface. 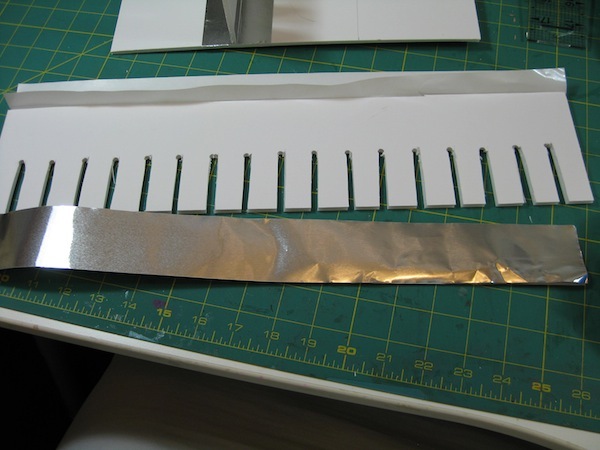 Open the two pieces of metal tape. Fold them back like wings. 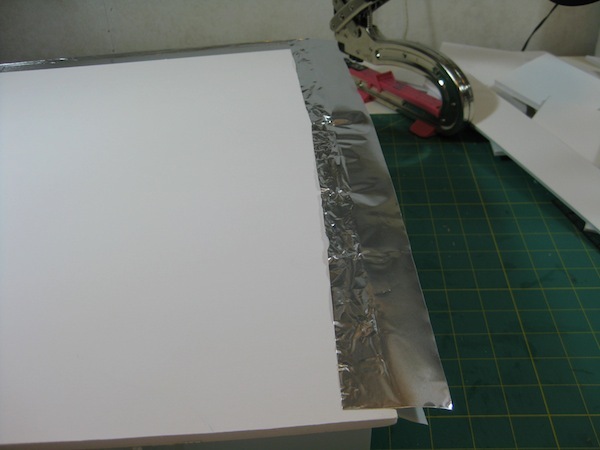 LEAVE THE PROTECTIVE PAPER ON THE TAPE. Line up your support with the pencil mark guide on the back piece. When you have the support properly lined up on your guide line then peel off the protective cover on the metal tape and press it down to the back piece. 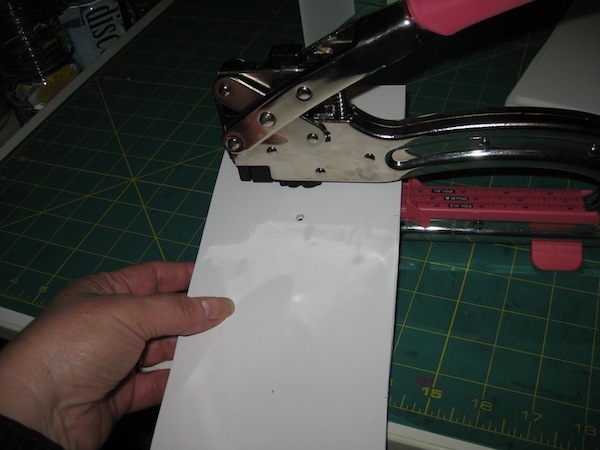 Use a bone folder to press the tape more fully to the back. Now do the same thing to the other side of the support piece. My shelves measure 5″ deep, 12-1/2″ wide. 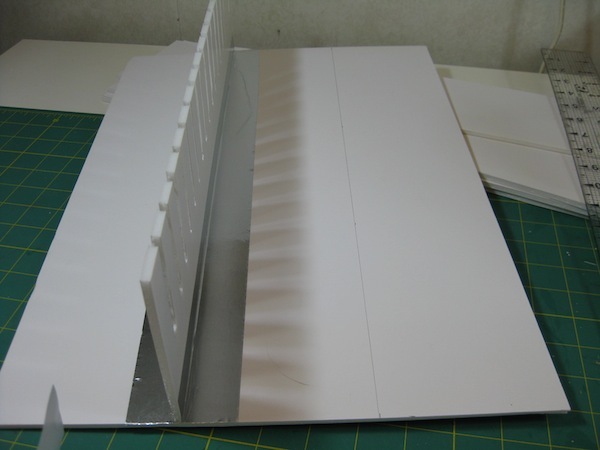 I’ve made the cut outs at 4-1/4″ and 8-1/2″. Using the Big Bite Cropadile to punch the hole at the top end of the cut out. Insert your shelf in the support and press down until it seats itself. 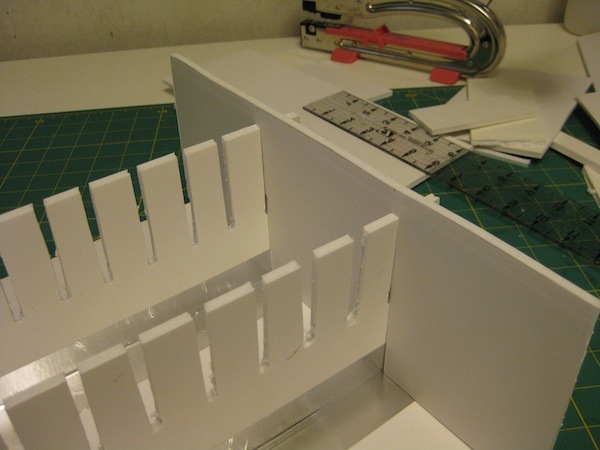 Make the rest of your shelves and insert them in the support slat areas. Test fit your ink pads to make sure they fit well. Now is the time to make any adjustments before you enclose this box with the sides and top. I have some smaller sized ink pads that will get lost under the shelves. 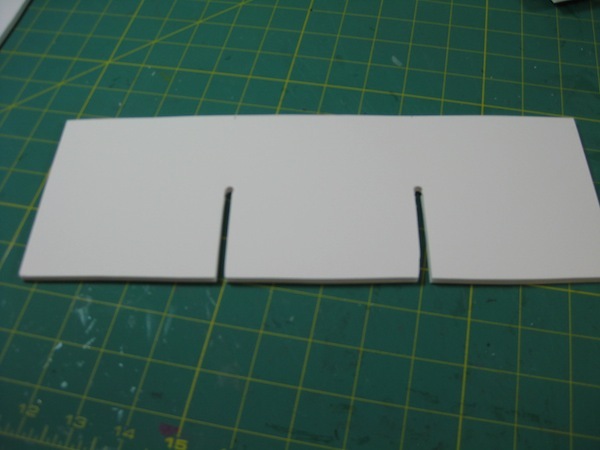 I cut several down to a 4-1/2″ width to compensate for the shorter pads. 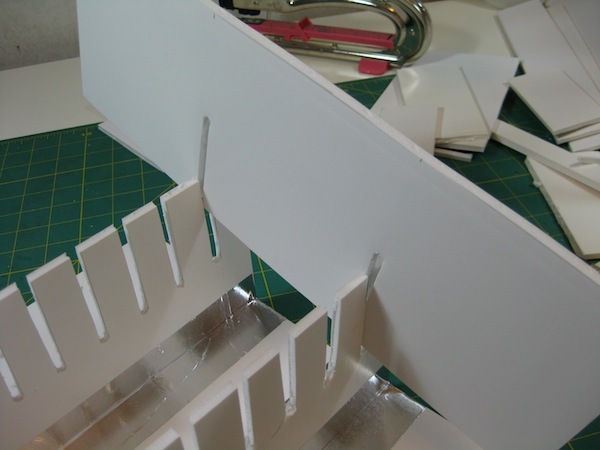 Then I even cut some shelves further to 3″ for the Tim Holtz Distress Ink pads. 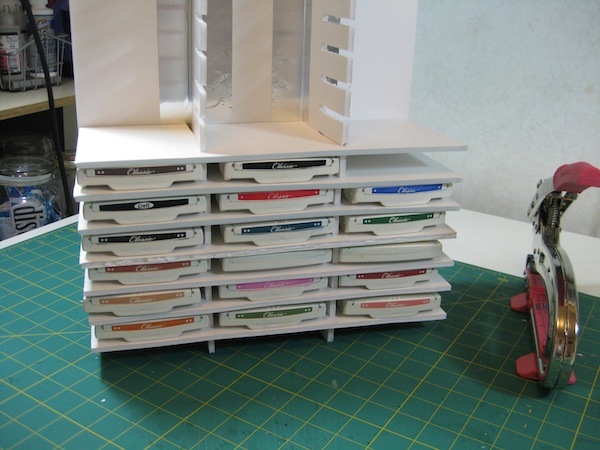 Once you have all your shelving in place and you have test fitted all of the ink pads, it is time to close it all in by adding the sides, top, and bottom pieces. I used the metal tape to do this. Same as with the supports. Only peel back half of the protective paper on the tape and adhere to the back side of the unit. 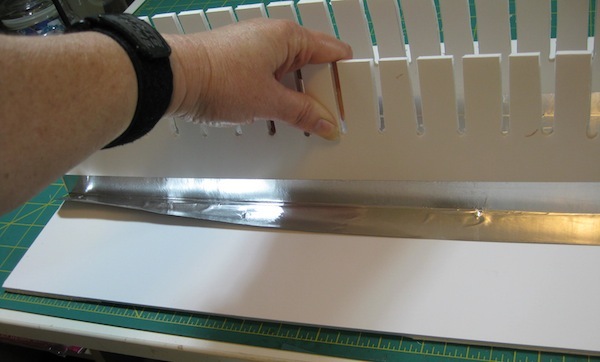 Press the tape down then burnish with the bone folder. 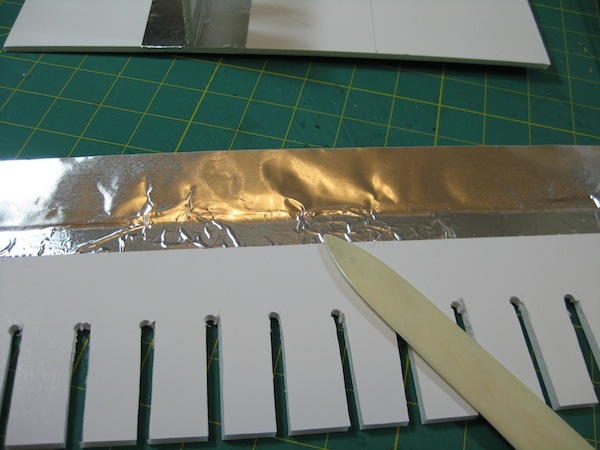 Then peel the protective paper all the way off and press one of the outer pieces – top or side piece – onto to the tape. 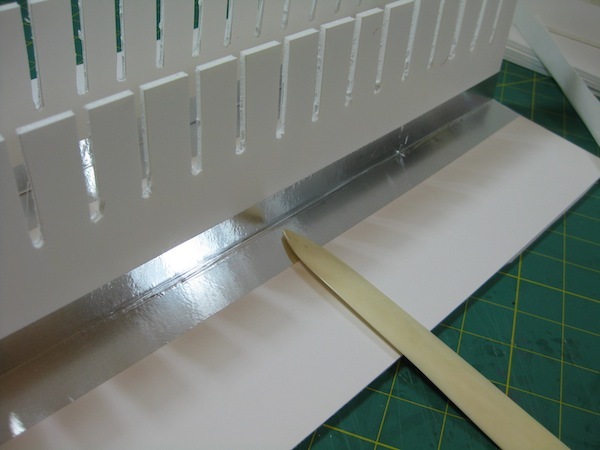 Make sure your edges line up before you fully press the tape into place and burnish down. Adhering the top piece. Peel back only half of the protective paper. 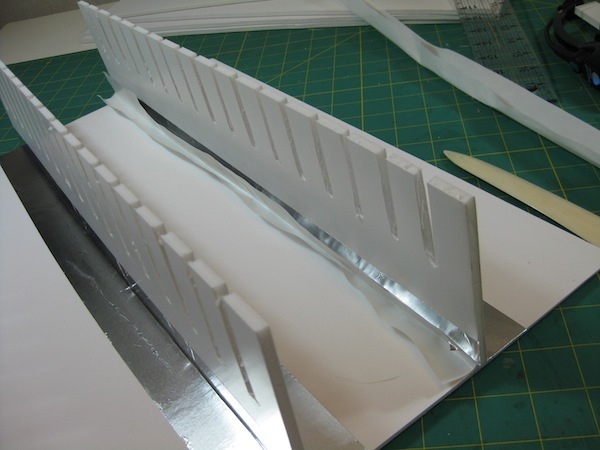 Once you have added all of the outer pieces then add the metal tape to the corners for additional support. 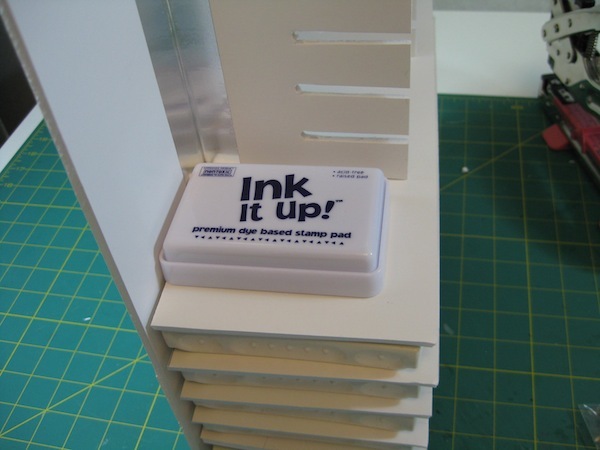 Fill your new storage system with your ink pads. Looks like I need to write on the outside of the ink pad what color it is. At least for the non Stampin’ Up! pads. I will have a video uploaded later today on how to make this. This is easy to make, takes a bit of time but the results are worth it. Even if it is a bit wonky. Well done! This looks easy enough to do once the maths has been sorted out 🙂 It is a nice tidy job too and ink pads are to hand, great stuff. Thank you Lynn 😀 I was going to make mine out of cardboard since I have a lot of it stored. But I don’t have any spray paint to cover it up and make it look pretty. I like the look of the white as it is. Hope you will get a chance to make one of these for yourself. It is easy to do. What an awesome idea for punch storage. 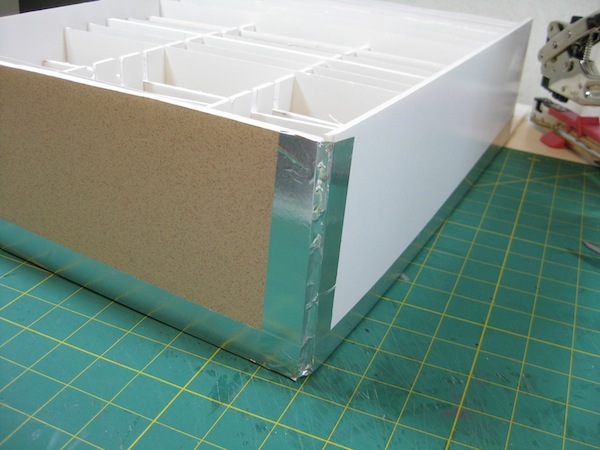 Leave a link to my blog with your completed organizer. I’d love to see it. Thanks for leaving a comment. I appreciate you. thank you! With your help, I can do this! Just what I need! Thank you, Suzi, for your kind words and enthusiasm :-). 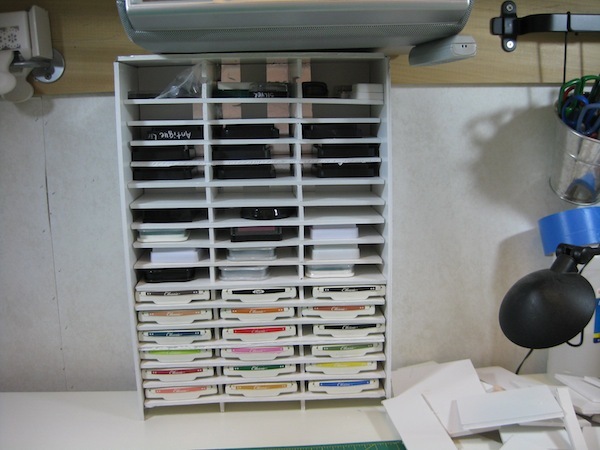 I look forward to seeing how you run with my instructions and create the all time best ever ink pad storage system for your supplies. Awesome-I can’t wait to make on. I still have to figure out what to do with the smaller mini pads. Congrats on the new grand–so precious! Thank you, Marsha, for stopping by my blog and leaving a comment. I appreciate your congrats on my newest grandbabies 😀 and letting me know you have found one of my projects to be of use to you :D.
Leslie, it came out great–I actually made two–one for smaller pads. Your method of punching holes for the end of slots is brilliant. Thank you, thank you, thank you.